At MyCarNeedsA.com, expert and thorough advice on car servicing, MoT and car repair problems forms a huge part of our output on the blog and we’re always striving to perfect the quality of this advice. Therefore, we’re proud to present a guest post from mechanic and lifelong car enthusiast Giles Kirkland. Giles presents some top tips and advice on ways you can improve your braking distance - hot off the iron press in the garage!We would like to personally thank Giles for his efforts and extend our thanks to all service providers under the MyCarNeedsA banner and their teams currently working to extend quick, easy and hassle free service to the British public nationwide. Being able to brake quickly is important for variety of reasons. When you’re stopping to avoid an obstacle, short brake distances ensure you can do this without having to veer out of the way. Likewise, simply being able to come to a halt effectively ensures safer driving - both for you and those around you. So, with this in mind, how can you ensure this process occurs smoothly? Here, we explore some of the ways you can improve your car’s ability to stop. Naturally, brakes that are in a better condition will brake more effectively than those that aren’t. You can check your brakes at home with a little attention to detail. Or, equally, you can have a professional do it, but it’s important to do this on a regular basis. Brake pads don’t last forever and, once they wear through the back layer of steel, they become rather ineffective. Likewise, if you notice your brakes are not working as efficiently, this could indicate you need to check them. Irregular wear can influence how quickly you are able to stop, for example. In short, if your brakes are worn out, many of the following factors will not make a difference. Braking fluid is important. If one of the lines to your brakes is cut, your vehicle’s overall performance is hampered. Yet, leaking fluid can be fixed - as long as you are able to identify it. For this reason, you should keep track of how much brake fluid you have. If you find that it is being used up more readily, without any major changes to your driving style, then this could be a sign of a leak. How do you diagnose a leak? It should be visible whenever your car is parked, as there will be a patch of fluid behind one of the wheels, indicating where this leak has occurred. If you discover a leak, it is very important you have your brakes examined, repaired or, if need be, replaced immediately. 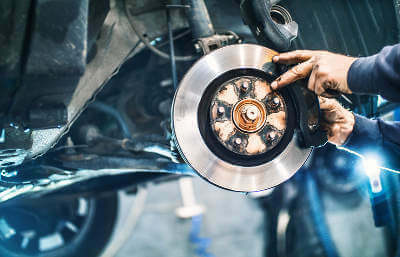 If you need a quick quote on brake repair in this scenario or any other, you can post the work to us to get a quote from our network of SPs at MyCarNeedsA.com. Aside from the brakes themselves, the wheels also influence how well your car comes to a halt. Specifically, your tyres make a big difference: after all, they’re the only part of the car that is designed to make contact with the road. To ensure the best grip here, your tyres should have the correct tyre pressure - over or underinflating the tyre will change its shape, causing a smaller, less effective contact surface area. Similarly, it is also vital that your tyres have a thick tread, as this is where the best grip comes from, while also offering a way to remove water. The thinner the tread is, the less effective these properties are. Furthermore, the difference in winter and summer driving conditions has an effect. Dedicated tyres are made for each season, to cope with the different temperatures. Yet directional treads are often preferred in the winter, as they offer better grip on wet surfaces. The sipes along the edges protect against aquaplaning, ensuring you can grip when there’s water on the road - but this disappears as the tyre wears down. However, in the summer - or if you do not want to change them - an asymmetric tread pattern offers an all-round level of performance. Okay, apart from the car’s condition, how can you (as a driver) help improve your braking distance? For a start, the faster you drive, the more time (and, thus, distance) you will need to bring the vehicle to a complete stop. This is one of the reasons residential areas often have lower speed limits, due to the density of people on the roads. As you increase in speed, it helps to be aware of this, so you can judge your distance more reliably. Similarly, it is easier to brake in a straight line. When turning, there is often less grip, due to the weight displacement in the turn, so it's important to take more caution when coming up to a turn, and brake in advance of it. So if you are able to, ensuring your wheels are straight whilst braking will increase the efficiency of your stopping times. We hope you have been able to garner some top advice from this post about improving your braking habits, speed and stability. With a little care and attention, you can smoothly refine your braking technique and attention-to-detail to ensure the most proficient operation of your brakes. A full-set of healthy brakes goes a long way to promising a healthy peace of mind, granting you the best and most relaxing driving experience.